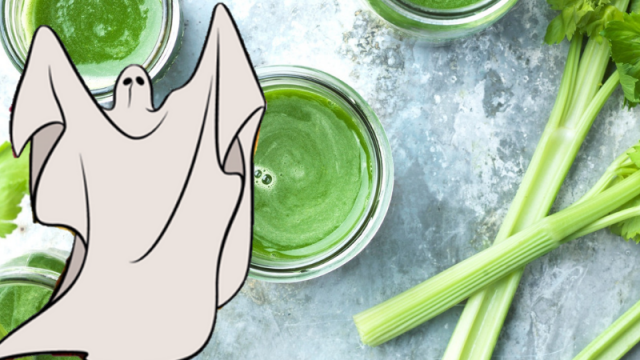 You may have had celery juice, but have you had celery juice freshly sourced by a ghost? The world of alternate health continues to hurtle around our newsfeeds, movement goosed by celebrity endorsement, its orbit never halted by the gravity of actual research or everyday common sense. Just this week, we witnessed one of our own tumbled into their nonsense supernova, as Miranda Kerr was photographed with legume-monikered internet shyster, David Avocado Wolfe. Anyway, Kerr can Kerr as much as she wants, because it’s irrelevant. She’s fallen in crazy alt-med steeplechase, overtaken by a far more insane piece of nonsense: Celery juice…suggested by a psychic medium. The author of this plot is a named that his parents named Anthony William, who now goes by the self-awarded handle the “Originator of Global Celery Juice Movement”, or a “medical medium”, if you’re short on time. To use the parlance of New York, I got yer Spirit of Compassion right ‘ere. I receive my information unconventionally. So that’s how it’s done. It’s through the gift of hearing the information. If you actually do any research on me, I hear a voice that gives me the information. But that information, as silly as it might sound to many, has actually helped millions heal, and I’ve actually dedicated my life to recovering people’s chronic illness with this information long ago. So it’s not like I woke up one morning and said ‘I’ve got too much celery in my fridge. Let me just use that by myself. Hey, I feel better today—now, let me go tell the world.’ That’s not it at all. The information was given to me. I mean, sure, Helen. But what are your sources? Hmm. I’m afraid it’s spectral peer review or GTFO o’er here.